On Saturday, police removed parts of an installation by Paul Yore from an exhibition in Melbourne, Australia. The installation, titled Everything Is Fucked, was part of a group exhibition celebrating the influence of Australian artist Mike Brown, who was prosecuted for obscenity in 1966. 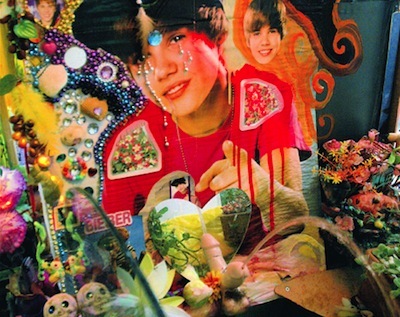 Yore's work includes collaged photographs of children, and a shrine to Justin Bieber decorated with dildos. The exhibition, Like Mike: Now What? ?, opened on 18th May at the Linden Centre for Contemporary Arts, and will close on 7th July. Five years ago, police removed photographs by Bill Henson from a Sydney gallery.